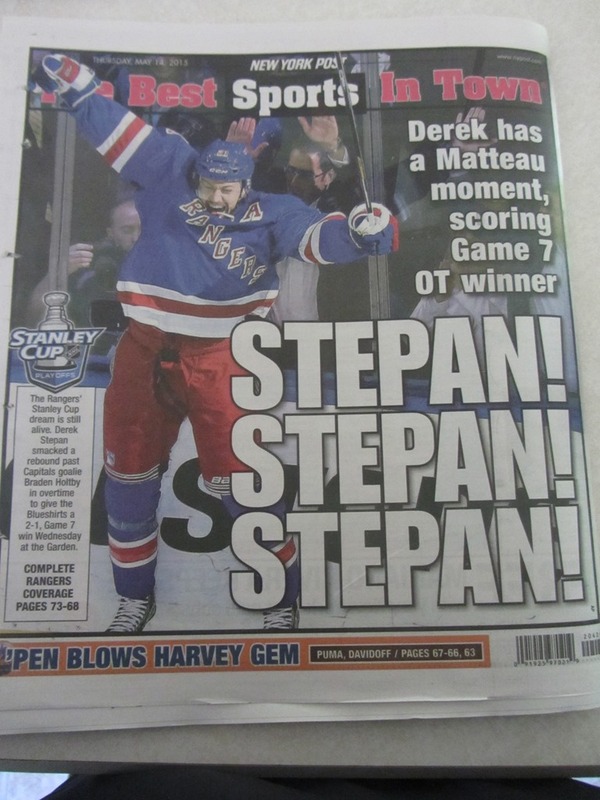 Stephen Matteau, stick raised, celebrates the greatest OT goal in New York Rangers history. 1. Matteau, Matteau, Matteau: Stephen Matteau’s wraparound goal early in the second overtime in Game 7 beat Devils’ goalie Martin Brodeur and sent the Rangers to the 1994 Stanley Cup finals, where they would end a fabled 54-year championship drought. The Howie Rose call “Matteau, Matteau, Matteau” lives on in Rangers lore. Matteau also scored a double overtime goal in Game 3. 2. Triple Threat: Bryon Hextall scored an overtime game-winner at the 2:07 mark in Game 6 as the Rangers beat the Maple Leafs, 3-2, to win the 1940 Stanley Cup. Alf Pike in Game 1 and Muzz Patrick in double overtime of Game 5 also scored OT winners as the Blueshirts captured their third Stanley Cup. 3. Cup Winner: Bill Cook became the first player to score a Cup-winning goal in overtime as the Rangers beat Toronto, 1-0, in the 1933 finals. The Rangers would vacate Madison Square Garden for the circus after a first game victory, and took the best-of-five series in four games. Cook was the team’s first captain and was later elected to the Hockey Hall of Fame. 4. Stepan, Stepan, Stepan: Derek Stepan buried a rebound midway through the first overtime and the Rangers knocked out Washington in a tense, seven-game Eastern Conference semifinal in 2015. Each game was decided by a single goal. 5. The Stemmer: Pete Stemkowski scored in triple overtime to end the fifth longest game in Rangers history and set up a Game 7 showdown with the Blackhawks in the 1971 semifinals. Despite Stemkowski’s heroics, which also featured an OT winner in Game 1, Chicago won the series in seven games. 6. Gravy Train: Adam Graves scored at 14:08 of the first overtime to lead the Rangers past the Devils and into the 1997 Eastern Conference finals. The 2-1 victory enabled the Blueshirts to win the series in five games despite losing the opener. 7. Raleigh Rally: Center Don “Bones” Raleigh scored overtime goals in Games 4 and 5 to beat the Red Wings in the 1950 Stanley Cup finals. However Detroit won Games 6 and 7, the last in double overtime after Raleigh’s shot hit the crossbar, to deny the Rangers. 8. Hot Rod: All-time Rangers leading goal scorer Rod Gilbert (406 goals), pictured at left, scored on a slap shot at 4:20 of the first overtime as the Rangers beat the Flyers, 2-1, in Game 4 of the 1974 semifinals. Philadelphia won the series in seven games, then beat Boston for its first Stanley Cup. 9. Gaborik’s Goal: Marian Gaborik’s tally at 14:41 of the third overtime gave the Rangers a 2-1 win over the Capitals in Game 3 of the 2012 Eastern Conference semifinals. It was the third longest game in New York franchise history. 10. Hagelin’s Heroics: Carl Hagelin’s goal in the first overtime of the 2015 first round against Pittsburgh gave the Rangers the series in five games. It marked the team’s series-clinching OT goal since 1997, and the first at Madison Square Garden since Stephan Matteau’s gamer 21 years ago. Workin’ overtime: Esa Tikkanen scored a pair of OT winners in a first round five-game series win in 1997…Bob Nevin delivered the clincher in Game 6 of a 1971 first-round series victory over Toronto…Fred Cook scored at 19:32 of the third overtime in the second longest game in Rangers history in the 1932 semifinals against Montreal. Football broke out at a baseball game on July 17, 1990, when the Kansas City Royals and the New York Yankees did battle at Yankee Stadium. That night, two-sports stars Bo JacksonBo Jackson and Deion SandersDeion Sanders, playing center field for their respective ballclubs, put on a display of power and speed that wowed the 26,777 in attendance. In the first inning, Jackson hit a two-run homer to dead center, just out of reach of a leaping Sanders. In his second at-bat, Bo said go as he crushed a long home run which landed three-quarters of the way up in the right center field bleachers, more than 450 feet from the plate. Before Jackson came to the plate for the third time in the fifth inning, New York manager Stump Merrill visited the mound and asked Yankee starter Andy Hawkins how he intended to pitch Jackson. “Outside,” Hawkins replied. “It better be way outside,” said Merrill. Hawkins pitched outside and Jackson went with the pitch, hammering a more pedestrian two-run blast over the right field fence. In his first three at-bats, Bo had three HRs and seven RBIs. See video. With the Yankees trailing 8-4 in the bottom of the sixth and a man on first, Sanders hit a line drive in the right center field gap which eluded a diving Jackson and rolled all the way to the wall. Sanders took a wide turn around third, crashed into catcher Mike Macfarlane, and then scrambled to touch home plate before Macfarlane could retrieve the ball for an inside-the-park home run. See video. Jackson injured his left shoulder on the play and had to leave the game, killing any chance of a record-tying four home runs in a single game. Deion’s HR was hit against Mel Stottlemyre, Jr., son of the former standout Yankee right-hander. Oh, by the way, the Royals won the game, 10-7. See box score. Ironically Jackson was drafted in the second round of the 1982 draft by the Yankees. But the shortstop from Bessemer, Alabama, decided to play football at Auburn University, where he won the Heisman Trophy in 1995 and was selected the first pick overall in the 1986 NFL draft by the Tampa Bay Buccaneers. But the running back never played for the Bucs. Tampa Bay owner Hugh Culverhouse gave Bo at ultimatum – play football or baseball but not both. Jackson decided on baseball, and a year later resumed his NFL career with the Los Angeles Raiders, before a serious hip injury suffered in the playoffs ended his four-year career. 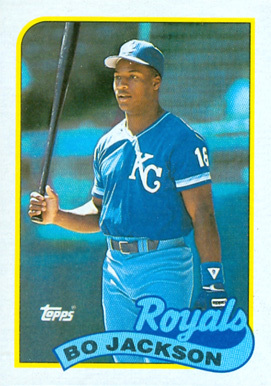 Jackson played for the Royals, Chicago White Sox and California Angels before retiring following the 1994 season. He is still the only athlete to be named an All-Star in two major American sports. Sanders, a cornerback at Florida State, began both his baseball career with the Yankees and his football career with the Atlanta Falcons in 1989. He is the only player to hit a home run and score a touchdown in the same week (he achieved both in his rookie season), and the only athlete to play in both a World Series and a Super Bowl. Deion batted .533 in the 1992 World Series, and won a Super Bowl in 1995 while playing for the 49ers. Sanders played for the Falcons, San Francisco 49ers, Dallas Cowboys and Washington Redskins in the NFL, and after sitting out several seasons, made a comeback with the Baltimore Ravens in 2005. In baseball, he played for the Yankees, Atlanta Braves,Cincinnati Reds and San Francisco Giants. Yankee Gridiron Connections: George Halas played six games in the outfield for the Yankees in 1919 before Babe Ruth came aboard the following season. For nearly 50 years, Halas was a player, coach and owner of the Chicago Bears and won six NFL championships…John Elway, a third baseman, played two years in the minors with the Yankees, but went on to lasting glory as a quarterback for the Denver Broncos. Elway won Super Bowls in both 1998 and 1998, his final two seasons in football.